Halloween is almost here, and, as everyone prepares for the scariest day of the year, dentists also prepare for the scariest day of their year. Halloween is fun for children, but their teeth suffer from the excess candy they tend to eat following Halloween. This year, we would like to offer you a couple of options to help make sure your children do not do too much harm to their teeth. Once your children return with their bag of candy, you should begin dividing it up into smaller quantities. You can buy small baggies and put a few pieces of candy in each bag, this way they are not eating too much at one time. Many parents let their children use pillowcases to carry their candy. What you may want to try this year is giving them a smaller container to carry their candy in. 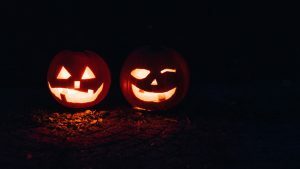 Any store that provides Halloween items will also include trick-or-treating bags and buckets. Another option for parents is to limit the area where your child goes trick-or-treating. This could be making sure they only stay in your neighborhood, or setting the number of streets they can go to. You could also set a curfew on when they should come back home. Every city has their trick-or-treating hours, so be sure to check what times people will be handing out candy. You want your child to have fun, but you also want to make sure they do not come home with a year’s worth of candy. It is important to remember to have your child brush their teeth before they go to bed after they have had any candy. Dr. Van Treese in Sidney, OH is always welcoming new patients. If you or your children are in need of a cleaning or other dental work, be sure to schedule an appointment with us today.